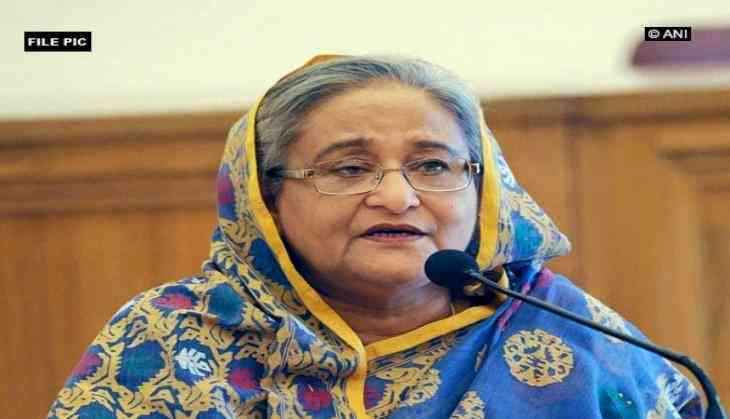 Awami League chief Sheikh Hasina was sworn in as the Prime Minister of Bangladesh on Monday. This is the fourth time that Hasina has become the prime minister of the South Asian country. It is also her third consecutive term in the office. President Mohammed Abdul Hamid administered the oath of office to Hasina and her cabinet, which will take charge after the current government's term ends on January 28. For the first time in 22 years, the Cabinet is made up of ministers from one party. The team, with mostly new faces, includes 24 ministers, 19 ministers of state and three state ministers. In a departure from previous practice, the names of the cabinet members were made public a day before the swearing-in. The oath-taking ceremony started with the recitation of the Holy Quran, according to The Daily Star. Hasina's party and allies secured 288 seats out of 299 parliamentary seats in the December 30 elections. The Bangladesh Nationalist Party (BNP)-led alliance rejected the poll results called for fresh elections. Hasina's key ally, the Jatiya Party on Friday decided to occupy the opposition benches in Parliament after the main opposition BNP rejected the results. Khatron Ke Khiladi 9: Wondering why Sreesanth was absent on the second day? Wife Bhuvneshwari gives the shocking reason! READ NEXT >> Khatron Ke Khiladi 9: Wondering why Sreesanth was absent on the second day? Wife Bhuvneshwari gives the shocking reason!